Stock # 146908, 6.0L Vortec 6000 V8 SFI Engine, Automatic, 55246 mi. This 2003 HUMMER H2 is offered to you for sale by Classic Motor Cars. Drive home in your new pre-owned vehicle with the knowledge you're fully backed by the CARFAX Buyback Guarantee. Do so much more with one vehicle. 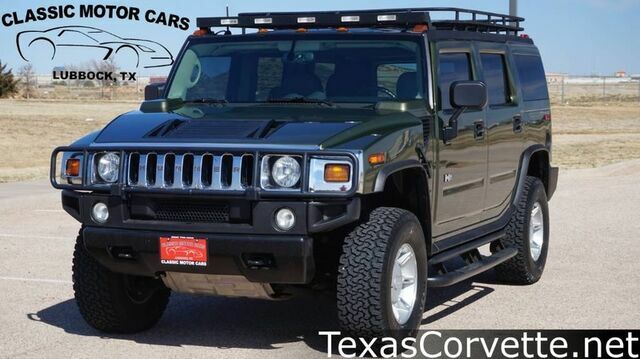 This HUMMER H2 gives you everything you need an automobile to be. The HUMMER H2 's pristine good looks were combined with the HUMMER high standard of excellence in order to make this a unique find. This vehicle comes with 4WD for better traction on unstable surfaces, like snow and dirt to give you the edge over anything you might encounter on the road. This 2003 HUMMER H2 has such low mileage it has been parked more than driven.